BOLD statements about a team’s potential are often made in the months leading up to World Cups. It is a time when normally grounded and stable individuals often make ridiculous claims about football teams. Remember the over-used term “golden generation”? It’s no longer fashionable or wise to use such words to describe a football team, because the margin between success and failure in the game is so fragile. Besides, such titles are usually self-appointed and a reflection of a vanity from the people who nurture or manage a group of players. It’s like TV chefs making their signature dish and salivating over it on screen. “This is really delicious” – actually, it’s not for you to say, matey – let others decide. When England misguidedly thought they had a golden generation, it was the squad that kept telling us that “we’ve got world class players” while it continually fell short of expectations. Nobody outside of England was placing the same type of garlands around their neck, in fact many overseas pundits felt that England were over-rated and full of their own publicity – “I’m going to be top scorer in the competition” – and products of a tasteless culture – “wags” dominating a German resort and all that. The golden generation was nothing more than a sporting manifestation of the age of spin, and of course, it failed miserably. The England set-up – more [hair] style than substance – adopted a stance very much aligned to the times we were living in, but it totally disregarded that other countries also had some decent players but misinterpreted the inflated wages they were earning as a sign of genuine quality. There’s little chance we’ll see a repeat in 2018 as expectations are low. People have been fond of declaring that a group of footballers represented the very future of the game. Malcolm Allison often made such boasts and in 1968, said his Manchester City side would terrorise Europe after winning the league. City went out at the first hurdle to unfancied Fenerbahce. In the summer of 1970, Jimmy Adamson, the manager of Burnley, anticipated his squad of young players, many of whom had been home grown, would be “the team of the Seventies”. Burnley had won the league title in 1960 and off the pitch, had been fairly progressive under Bob Lord, but they had long been sent into the shadows by Manchester and some of their players became big targets. There was no doubting that Burnley had some talent on their books – Ralph Coates, Martin Dobson, Dave Thomas, Frank Casper, Willie Morgan, Steve Kindon and others who came later like Leighton James. In 1968-69, Burnley walloped champions-elect Leeds United 5-1 at Turf Moor with a team that had an average age of just 22. Dave Thomas tormented Leeds and prompted Don Revie to rate the winger possibly the finest talent in Europe. Of course, Burnley could not sustain that type of form or keep their young stars. Morgan had gone by then to Manchester United, the excellent Coates went to Tottenham in 1971 for close to £ 200,000 and Thomas was signed by QPR in 1972. 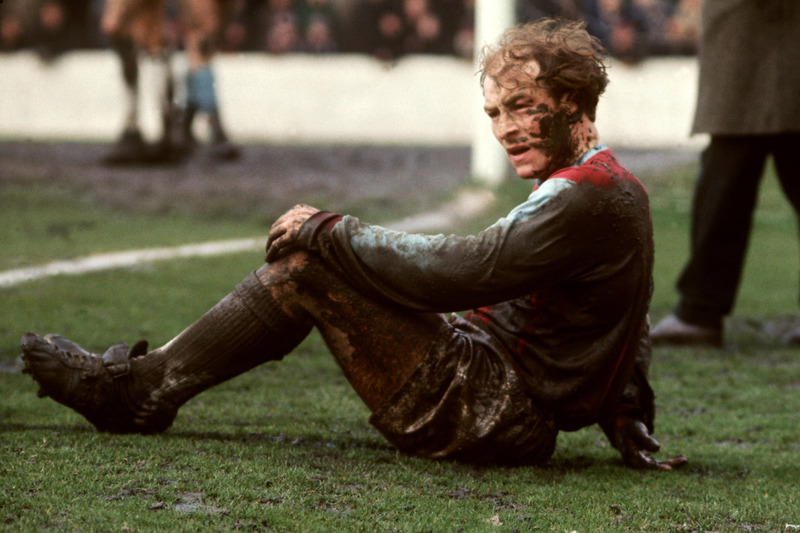 Burnley made their worst start to a season in 23 years in the autumn of 1970 and were relegated at the end of 1970-71. They won promotion in 1973 and finished sixth in 1973-74, but they went down again in 1976. That “Team of the Seventies” didn’t come off and the line-ups that could more appropriately be considered the leading lights of the decade were pretty much the same old names. Move on a few years and Scotland went to Argentina with a more than competent squad. Ally MacLeod was good at whipping-up the press with predictions of a Scottish triumph in the World Cup, saying he had the best midfield on the planet. Scotland fielded the likes of Bruce Rioch, Don Masson and Asa Hartford in that world’s best midfield for their first game against Peru (1-3) and then dropped two thirds of it for the second game against Iran, a lack lustre 1-1 draw that all but eliminated the team. MacLeod, who had mastered the art of media manipulation, was on his way home after the group games, despite a spirited third game against the Dutch, inspired by Graeme Souness and Archie Gemmill. At the same time, Crystal Palace had been burdened with the anvil of expectation when they were tagged the “team of the eighties”, a title that truly belonged to Liverpool. Palace’s team, managed by Terry Venables and constructed around the club’s FA Youth Cup winning teams of 1977 and 1978, was a genuine product of hype, no doubt encouraged by the media-savvy Venables. That Palace side included some exciting young players, most of whom just fell short of realising their full potential. Kenny Sansom (86 caps) and Terry Fenwick (20 caps) enjoyed successful England careers, and Billy Gilbert played over 250 games for Palace, while Vince Hilaire, who was so well regarded that a TV documentary was made about him, never fulfilled his promise. Hilaire was ahead of his time, in many ways, but was all too frequently the target of racists. Palace won promotion to the top division in 1979 and for a while, took it by storm, leading the table and playing with some panache. Financial difficulties and Venables’ departure to Queens Park Rangers stopped that team in its tracks and in 1981, Palace were relegated. The “team of the 80s” dispersed, Sansom and Peter Nicholas going to Arsenal, Fenwick to QPR, and the dream was over. The term, “golden generation” often applies more to national teams, and there have been a number over the years – Portugal 1994-2006; France 1998-2006; Ivory Coast 2006-2014; Belgium 2013 – to date; Nigeria 1994-1998; Yugoslavia 1987-1992 and Germany 2006-2014, to name but a few. Of the current national teams preparing for Russia 2018, Belgium are in the midst of their so-called stellar period. Like so many of the squads that are considered to represent the pinnacle of their country’s player development, Belgium have yet to realise their promise. Is it wrong to declare immortal status until a team actually realises its potential? The gilding that comes with success can surely only be applied once the team has proved its ability, shown that it was better than its peers. This is where football goes very wrong and allows itself to be swallowed up by hubris, by needless chest-beating and also to become the plaything of self-serving managers and directors. “It’s good because we said it is good.” Burnley fans are claiming their current team is the “best ever”, which seems a little unkind to the teams that won the Football League in 1921 and 1960. Let’s not take anything away from Sean Dyche and his players, in the Premier years (which contrary to many people’s thinking, was not when football started), this is the best Burnley side. Now, when any group of players receives the accolade, “golden generation” there should be a few caveats, but best of all, placing such hopes on those still developing their craft must be avoided. And therein lies a message for the Football Association in connection with some of the young players being thrown into Gareth Southgate’s squad. Let the raw material turn gold in the aftermath of achievement!